The mosquito guts harbor a vast array of diverse commensal bacteria, the microbiota, which perform many functions for host physiology and health, particularly in modulating host immune homeostasis and the outcome of pathogen infection. Beneficial to the host in healthy state, the gut microbiota is now being considered a host “forgotten organ”. Unlike viruses, bacteria and parasites, which need to be ingested to cause disease, fungal pathogens infect mosquitoes through the cuticle and proliferate in the hemolymph. 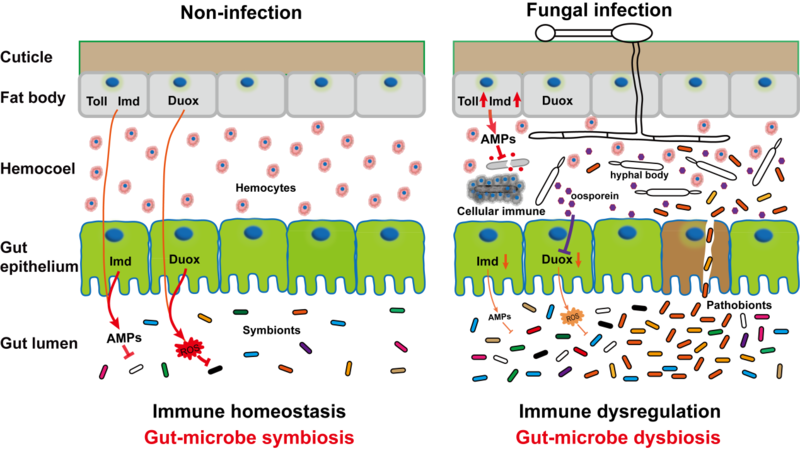 However, fungal pathogenesis studies have primarily focused on interactions between the fungus and the host insect, without considering its possible interactions with the gut microbiota. Prof. WANG Sibao and his colleagues at Shanghai Institute of Plant Physiology and Ecology of Chinese Academy of Sciences discovered a contributory role of the gut microbiota in accelerating fungal killing of mosquitoes. The study was published in PNAS. They reported that mosquitoes with gut microbiota die significantly faster than mosquitoes without microbiota, following topical infection with the pathogenic fungus B. bassiana. Fungal infection induces imbalance of gut bacteria by tremendously inducing the overgrowth of the opportunistic pathogenic bacterium Serratia marcescens, which further translocates to the hemocoel and promotes fungal killing of mosquitoes. Fungal infection was further revealed by researchers to result in the down-regulation of antimicrobial peptides and dual oxidase in the midgut, and consequently leads to dysbiosis of the midgut microbiota. These findings provided new insights into the role of the gut microbiota and the mechanisms of fungal pathogenesis in insects, and may yield new strategies for biological control of mosquitoes and disease interventions. This study was financially supported by the Strategic Priority Research Program of the Chinese Academy of Sciences and One Hundred Talents Program of the Chinese Academy of Sciences.